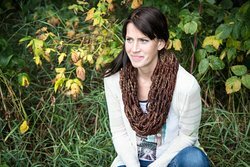 Emily T. Wierenga is an award-winning journalist, blogger, commissioned artist and columnist, and the author of five books including the memoir Atlas Girl: Finding Home in the Last Place I Thought to Look (Baker Books). All proceeds from Atlas Girl benefit Emily’s non-profit, The Lulu Tree. She lives in Alberta, Canada with her husband and three children. For more info, please visit www.emilywierenga.com. Find her on Twitter or Facebook. This is one of my favorite verses. It is a shepherd’s staff to me. It’s the most utterly honest verse in the Bible next only to “Jesus wept”, full of such humanity, desperate for such divinity. We fear too much, and this is what causes hypocrisy. We fear our own sinfulness, our own fragility, when it’s this very fragility, this sinfulness, that leads us down the path to our Savior’s cross. It’s in uttering “Help my unbelief” at the foot of that cross that Jesus reaches down and pulls us up to His heart, beating beneath the battered exterior of His skin. In short, this verse expresses hope in the gentleness of God. It says, look—we have a God who knows everything about us, and loves us anyway. Who still sent His son to die for us in spite of seeing what we did to all His prophets. Who still longs to be close to us. The least we can do is be honest with Him. Honesty is the greatest offering, because in doing this, we are giving Him ourselves, and then and only then can true faith begin to form—in the broken heart of the repentant. Blessed are those who never see the fulfillment of God’s promises in their lifetime, because for them, those promises extend to eternity. And while we’ve received our reward in full, theirs will last forever, in the city of Zion. In short, I would define belief in God as placing all hope in One we cannot see. Being a disillusioned pastor’s kid who’s struggled her whole life to know the truth behind the church, who longs to know the power of the gospel and the promise of the resurrection (beyond the religious practices of Sunday) I do not know one without the other. Perhaps I’ll describe it best by relaying a story. I stopped believing in Christianity on a mission trip to Vancouver, BC, when I was 18. We were visiting a Buddhist temple, and I was struck by the absolute reverence of those bowing, shoeless, within the temple, incense burning and the holiness palpable. I stood there confused, because in all my years of Sundays I’d never found such reverence in a church. And that was the day I stopped believing in Christianity. I spent the rest of the mission trip just meeting with people instead of proselytizing them, listening to their stories instead of preaching them a sermon. At the end of the week before heading home I talked with my Mum on the phone. She asked me what had been going on that week, and I told her what we’d done. Then she said, “No, but really what has been going on? God has woken me up every night this week to pray for you.” I practically removed my shoes right then and there. I told her how I’d stopped believing at the temple. Yet God had had mercy. I knew then that I didn’t doubt Jesus; I doubted Christianity, but that I would forever follow Jesus in spite of the blunders of our man-made practices.